Outfit of the Day: Missguided Printed Midi Dress. This is just a quick OOTD from Saturday night. I popped home back to Cheshire where my parents live for the night, because one of my best pals returned from travelling and we went for a delightful night out. The palaver of getting my mum to take this photo is the reason why I look like a genuine gomp (particularly as my brother and dad were chuckling to themselves in the background SHUT UP DAD, THIS IS WHAT BLOGGERS DO). I’ve actually had this dress for a while now, but I haven’t worn it out properly (believe it or not, I wear it to work a lot. And get many a strange look. Subtlety is not my speciality). 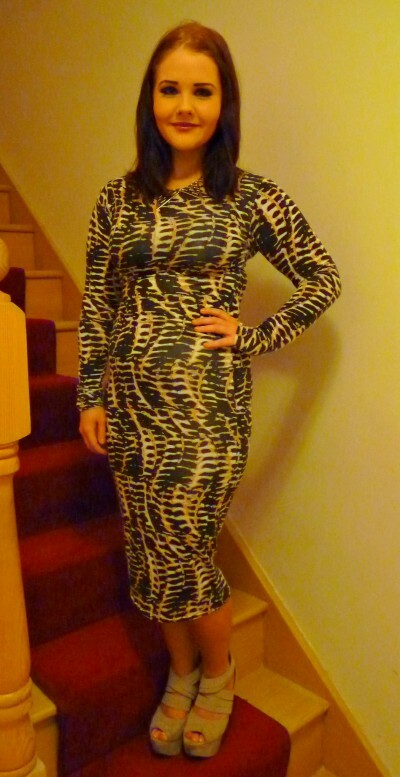 It’s a little Missguided number and I’m assuming it’s snake print, but it may also be tiger print. Or some kind of tie dye. You choose ;). It can be bought at the bargain price of £14.99 here if you’re interested! I teamed it with a pair of hoof like wedges that I bought for gradball last year (sob sob, where has my life gone), which I do like but are a big baggy around the ankles. They were from Garage Shoes (I am a tramp, I know) and I am fairly certain that they are no longer available! and we also have a giveaway on at the moment! Lovely Outfit ! I love it !